Returns ets model applied to y. Usually a three-character string identifying method using the framework terminology of Hyndman et al. (2002) and Hyndman et al. (2008). The first letter denotes the error type ("A", "M" or "Z"); the second letter denotes the trend type ("N","A","M" or "Z"); and the third letter denotes the season type ("N","A","M" or "Z"). In all cases, "N"=none, "A"=additive, "M"=multiplicative and "Z"=automatically selected. So, for example, "ANN" is simple exponential smoothing with additive errors, "MAM" is multiplicative Holt-Winters' method with multiplicative errors, and so on. It is also possible for the model to be of class "ets", and equal to the output from a previous call to ets. In this case, the same model is fitted to y without re-estimating any smoothing parameters. See also the use.initial.values argument. If TRUE, use a damped trend (either additive or multiplicative). If NULL, both damped and non-damped trends will be tried and the best model (according to the information criterion ic) returned. Value of alpha. If NULL, it is estimated. Value of beta. If NULL, it is estimated. Value of gamma. If NULL, it is estimated. Value of phi. If NULL, it is estimated. If TRUE, will only consider additive models. Default is FALSE. Box-Cox transformation parameter. If lambda="auto", then a transformation is automatically selected using BoxCox.lambda. The transformation is ignored if NULL. Otherwise, data transformed before model is estimated. When lambda is specified, additive.only is set to TRUE. Optimization criterion. 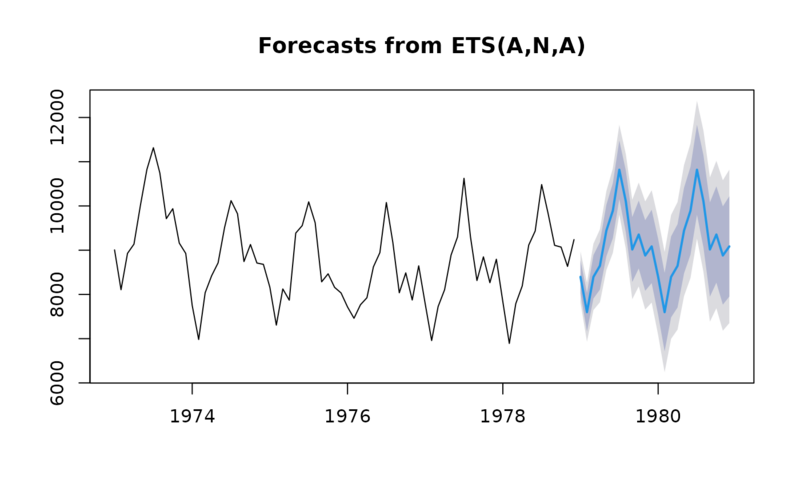 One of "mse" (Mean Square Error), "amse" (Average MSE over first nmse forecast horizons), "sigma" (Standard deviation of residuals), "mae" (Mean of absolute residuals), or "lik" (Log-likelihood, the default). Number of steps for average multistep MSE (1<=nmse<=30). Type of parameter space to impose: "usual" indicates all parameters must lie between specified lower and upper bounds; "admissible" indicates parameters must lie in the admissible space; "both" (default) takes the intersection of these regions. Information criterion to be used in model selection. If TRUE (default), the models with infinite variance will not be allowed. If TRUE, models with multiplicative trend are allowed when searching for a model. Otherwise, the model space excludes them. This argument is ignored if a multiplicative trend model is explicitly requested (e.g., using model="MMN"). If TRUE and model is of class "ets", then the initial values in the model are also not re-estimated. A function which indicates what should happen when the data contains NA values. By default, the largest contiguous portion of the time-series will be used. An object of class "ets". The generic accessor functions fitted.values and residuals extract useful features of the value returned by ets and associated functions. Based on the classification of methods as described in Hyndman et al (2008). Hyndman, R.J., Koehler, A.B., Snyder, R.D., and Grose, S. (2002) "A state space framework for automatic forecasting using exponential smoothing methods", International J. Forecasting, 18(3), 439--454. Hyndman, R.J., Akram, Md., and Archibald, B. (2008) "The admissible parameter space for exponential smoothing models". Annals of Statistical Mathematics, 60(2), 407--426. Hyndman, R.J., Koehler, A.B., Ord, J.K., and Snyder, R.D. (2008) Forecasting with exponential smoothing: the state space approach, Springer-Verlag. http://www.exponentialsmoothing.net.